Technique Secrets are the essential pianistic movements, gestures and touches — a scaffold of progressing skill development. We see wide variety in students in the type of music they wish to play, in the level of commitment they bring to practice, and in coordination and listening abilities. However, one thing we know for sure — everyone wants to play well. Everyone would like to enjoy brilliance in sound and touch at the keyboard. This takes us to the heart of technique and artistry: how we teach it, how we sequence it, and how we develop it step-by-step to bring out the “musical character” of our students. Another thing we know: it’s not going to happen for our students unless we teach it to them. We instruct through demonstration, imaginative metaphors, and well-chosen repertoire. At each lesson we reveal our artistic engagement, physically and expressively. 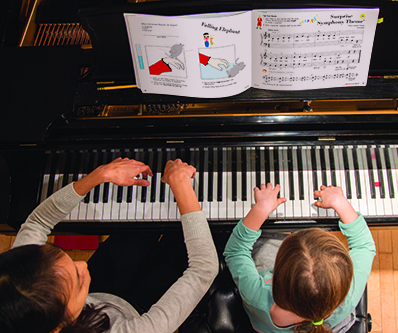 Technique and artistry is embedded in the Piano Adventures curriculum. At each level, the Technique & Artistry books present “Technique Secrets”— essential pianistic movements, gestures, and touches. These “secrets” are harmoniously sequenced and present a scaffold of progressing skill development. Indeed, these technique and artistry principles are comprehensive — applicable across all the piano repertoire. Apply them liberally to the Lesson Book, Performance Book, the Piano Literature Collections, and yes, even the Popular and Rock ’n Roll Books. 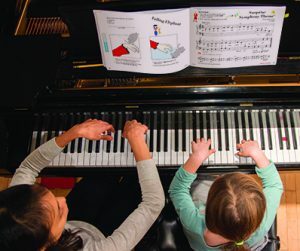 For there is a beauty of “sight, sound, and story” when a 5-year-old admirably plays Twinkle, Twinkle Little Star with a rounded hand shape, steady rhythm, and attentive focus. A round of applause and a big smile —Technique and Artistry! There is excitement in hearing a middle school student play the Burgmuller Ballade with a fine up-touch for the R.H. chords and well-articulated 16th-notes for the rapid L.H. melody — Technique and Artistry! And then there is the concert artist. With a lifetime of study and practice, technique is now a panorama, a vast neural network of physical and perceptual connectivity, touch, and sound — Technique and Artistry! Teaching is not a science; it is art and craft. So let’s develop our educational technique and artistry. We can reap the rewards of new approaches, applications, and insights for our own teaching and playing — Technique and Artistry! Learn more about technique and artistry at every level of Piano Adventures in our new 2017-2018 Catalog and Desk Reference. Hello, my name is Jaydon Ford (11th grade, 17 years old). I am doing a project for my AP Language and Composition class and I was wondering if there was anything that you would be able to help me on. The objective of this assignment is to pick a topic you’re interested in, learn about that topic, and apply your research to a final product. I have always been interested in piano so I decided to learn it for this project. I was wondering if there was any way you could contact me back to see if there was anything you could inform me on or if there was anything you could send me to help me with this goal. Hope to hear back from you. I totally love your books. Been using them for the past one year. Though they are not readily available in our country, Kenya. Could you do something to facilitate this? There is a big demand for quality books since the only ones mostly available are John Thompsons, and none other to supplement this. Hi Eric — Thanks for posting your comment. Our books are distributed around the world by the Hal Leonard Corporation. I reached out to my contact there. They just signed a new dealer in Kenya. The name of the store is “Music House” in Nairobi. The owner’s name is Mohamed Juma. His email is MUSICHOUSE@SWIFT-MAIL.COM and the telephone number is 2542035525. You can order whatever Faber Piano Adventure titles you need from Mohamed.